We recently sponsored the 2014 Bloom event in conjunction with Kevin Dennis. On the behalf of Renault Ireland, I would like to say that it was an honour working with Kevin and his team. He is a true professional and excellent at what he does. His creative flair shown through in our Garden and enabling us to win a Gold award at Bloom. Kevin went above and beyond to ensure we received the best out of the partnership. It was a pleasure working with him and I would strongly recommend Kevin to deliver on any project. We look forward to working with him again in the future. We found Kevin great to work with, and would absolutely recommend him to anyone planning work on their garden.We knew we wanted to make changes to out garden, but didn't have a clear idea of what we wanted. Kevin had a knack for grasping our ideas, and came back with proposals better than we had been able to come up with ourselves.He paid great attention to detail, and if he noticed something amiss or not up to his standards he made sure it was fixed. He was very flexible, had no problem accommodating changes of mind we made during the project, and went above and beyond what we had hoped for.Kevin was very generous with his time, and always made sure we were happy with every stage of the plans. He and his team were incredibly professional throughout, produced a very high standard of work, and were exceptionally easy and pleasant to work with. Kevin is a very skilled designer (we have seen numerous examples of this over the years) And a great example at Bloom this year – a silver gilt with his first show garden. In this situation his client in Raheny took delivery of a high impact design with strong architectural elements complemented by brave use of colour and bold planting such as the Dicksonia tree ferns. I cannot recommend Kevin Dennis highly enough, even though we knew exactly how the garden was going to look the finished product still managed to exceed our expectations and myself and my wife were very very happy. Kevin is a great designer with lots of ideas but has a practical side too and knows what works best. He is totally engrossed in what he does and in getting everything right, he listened carefully to us, incorporated our ideas and brought a lot, lot more in terms of planting and design. Other factors worth mentioning, great workmanship, lines, levels and attention to detail 10/10. We really enjoyed the whole project from start to finish and that has to be a reccomemdation in itself. 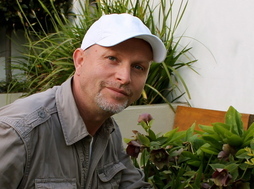 Kevin has a great philosophy about his work and I am very certain he is going to scale the heights in garden design. David & Yolanda, Beaumont,D9. • Colm & Deirdre - Artane Patio garden, Thorndale, Artane. We wanted a calm and relaxing garden and to be able to sit and eat in the natural suntraps. We came up with a vey basic idea and Kevin came up with some wonderful suggestions and improvements and knew exactly what we had in mind. The work was carried out during the wettest time in May and despite this there was little or no mess and was undertaken by him and his team with the greatest expertise and good humour. The quality of materials, the colour scheme, the planting suggestions, everything, exceeded our expectations. We have been enjoying our little oasis of calm, tranquility and beauty since, which happened on time and within budget. We would recommend Kevin and his team to anyone considering a garden makeover, couldn't have asked for better. • Lizzyg – St Margarets. Kevin had great ideas of how to create a beautiful garden for the family to relax in while taking into consideration our two dogs, as it is their garden too. Both Kevin and his team did a fantastic job and I would highly recommend him to anyone considering having their garden transformed. Elizabeth & Paddy, St. Margarets Road, Finglas. • Trish & Mark Traynor – Rush. • Neil & Sandra – Dartry. Kevin and his team transformed my garden in September 2010 and I found his work exceptional. His team were professional, tidy, punctual and worked to tight deadlines and the end results were simply fantastic - I would have no hesitation in recommending Kevin and his team and I hope to use him again in the near future. Neil & Sarah - Dartry Dublin 6. • David & Mary – Sutton. I dont normally do reviews on companies but am very happy to rate Dennis Garden Design as thoroughly professional and creative landscaper. The main plus was all the ideas that I was given. I was amazed at what could be achieved without having to re-mortgage my house, After agreeing to the lay out for the garden, the job was done exactly as had been agreed and the standard of workmanship was excellent. Happy to recommend Kevin and the team for any garden job. David and Mary - Dublin Road. Sutton. My garden had been a hovel for ever! Finally I decided I couldn't wait any longer and searched gardner websites. What caught my eye about Kevin Dennis's website above all other sites I looked at, was clear evidence from his website gallery of his team's ability to simply transform any garden. I had a general idea of how I'd like my garden to be - not just a lovely area to enjoy spending time in, but I wanted something original and I wanted that 'wow' factor. Kevin is the complete professional. He spent ample time discussing plans before work commenced and provided clever ideas to enhance my own vision of how the garden would finally look. Kevin and his team are all garden enthusiasts and were corteous and tidy throughout the job. My finished garden is simply stunning. It definitely has the absolute wow factor and I'm the envy of my friends! I would recommend Kevin 100% and am already saving to get my front garden done! Thanks Kevin, I'll be back! Val, St Assams, Raheny. Would like to recommend Kevin and him team 100%. Our garden was a rubbish site after building work and although we had several quotes from landscapers we picked Kevin as he was the only one to sit with us and spend ages working out what we wanted from the space. In fact, he came out several times to just discuss. We got new patio, raised beds, cobble lock car port (perfectly done! )and grass area. His team worked very long hours and got the job done in 5 days, which was amazing. We liked his professionalism and commitment to getting it looking right. Still love coming home and seeing the garden through the window! Miriam & Mark. Kevin and his team were just perfect! After humming and hawing over several quotes and spending two years attempting unsuccessfully to do something with the mess that was my back garden, Kevin came along and just made it happen. Easy to talk to, even if like me you have no clue what you're talking about, will explain everything in laymans terms, works to the budget you have, and designs, works and cleans up like a dream! No question I'd recommend them to anyone! Stacey & Paul, Ayrfield, August 2009. Kevin and his team did a superb job transforming my garden from a wilderness to a beautifully landscaped paradise. They worked ceaselessly for two solid days leaving my place in immaculate condition. I couldn't recommend them highly enough. Kieran, Firhouse, D24. We are delighted with the added living space created by Kevin and his team in our home. They transformed a problematic, unusable garden into a delightful relaxing area with imagination and style. We are delighted with it and would highly recommend Dennis Garden Design who displayed professionalism, all round courtesy and flexibility from start to finish. Couldn't be happier! K&U, Balbriggan. Kevin and his team did a fantastic job on our front garden, absolutely delighted with the result. The team are extremely clean workers and Kevin himself is very helpful and professional. We would highly recommend Dennis Garden Design. Gwen + Derek, Clonliffe, D3. Kevin and his team can be described in one word - EXCELLENT. They were quiet, fast and efficient. I would highly recommend them. Got Kevin to design my back garden and was so happy with the outcome that I decided to get him to design the front as well. Kevin takes pride in his work and the results prove this. I would highly recommend him. Simon, Portmarnock. After getting various quotes from other landscapers, we found kevin to be the most enthusiastic & helpful when it came to ideas for our garden. It was refreshing to find someone who takes such pride in their work. We are extremely happy with the end result and highly recommend Kevin and his team to anyone...Thanks for our fantastic garden. Emer & Robbie Beaumont, Dublin 9. Kevin and his team did a wonderful job in creating a beautiful garden, which immediately became part of my home. At all stages of the process, he was courteous, polite and open to client lead requests. Both he and his team were respectful of my home and my neighbours and at no time did I feel the work was intrusive. I would have no hestitation in recommending him for other projects. He has created a special space for treasured memories. Thank you. Annie, Firhouse. Kevin and his team did a super job in creating an extra "room" for my home. He listened to my views, challenged where neccessary and then delivered in a very efficient manner. Great attention to detail. He had been recommended by a colleague and I in turn would not hesitate in recommending him and his team. Adrienne, Raheny. Kevin and his team did an absolutely fabulous job transforming what was once an overgrown building site into a beauitiful, easy to maintain, child friendly and tranquil garden. I would have no hesitation in recommending him in the future. Garrett, St Lawrence Rd, Clontarf. Kevin and his team are creative, fast, efficient and tidy - they do exactly what it says on the tin and we would recommend them highly to anyone who is looking for a touch of magic. And if that isn't enough....they are nice guys too ! Yolanda D13. August 2008 Getting Kevin and his team in to create our garden was the best thing weve ever done.His professionalism,his attention to detail in everything he does is a testament to how well his natural ability kicks in from the first visit to the finished product. .We cannot reccomend him highly enough.It does not matter the state of your garden,He has the ability and insight to give you what you did not think you could have.Which is, a beautiful,individual garden,to enjoy no matter what time of year.Kevins design was unique.We have enjoyed the garden so far despite the weather. With Thanks. Derek & Nuala. Kevin and his team absolutely transformed our garden last month (Aug 08). We still find ourselves looking at it almost in disbelief. It looks great even in the rain! I would strongly recommend Dennis Garden Design and have already done so to family, friends and neighbours. Even though our house in Raheny has no side or rear entrance, Kevin completed the work cleanly, efficiently and to a very high standard. A very honest, hard working, trustworthy team. Thank you so much for doing such a fantastic job. John and Mary. Raheny. Got our garden done in May although it has rained since we did get in a few b b qs. Friends can't believe it is the same garden and it was done in 7 days. I love it! I can now just open my back door and let the kids run out and not worry that they will fall down steps. The standard of work was brillant, very professional. I am recommending them to all my friends who need a new garden. Annmarie, Artane. Extremely happy with the result. Cant stop looking at my garden it has completely transformed into something beautiful. Cathy, Rush Co. Dublin. A really high standard of work, would definitly recomend. Delighted with the work done by Dennis Garden Design, fantastic job on our front & back gardens - very efficient & creative. More than willing to recommend. Top Class. Kev & Emma, Bayside. First rate job, clean, fast, friendly service. Professional from start to finish. Highly recommended. Dave + Sarah, Ratoath. My garden has come to life thanks to Kevin Dennis. Great job. Andreas, Raheny.